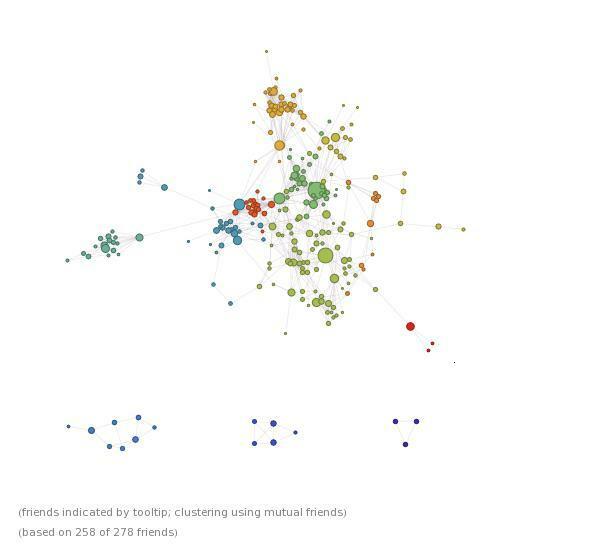 This image has been produced by software developed by Wolfram/Alpha and is based upon data on my friends and mutual friends it has accessed from my Facebook account . Far more than a pretty graphic, which bears more than a passing resemblance to a map of a galaxy, this chart provides an example of how researchers can harness the power of new computing technology and social media to shed new light on areas of interest; This particular chart mapping my friends and mutual friends provides a great illustration of my ‘social capital’ – broadly speaking the social connections I have and groups I may belong to. As a researcher I may be interested in how social capital varies by age, gender, ethnicity and employment status. It may also be possible to take a longitudinal approach; how does my social capital change over time, what happens when I become a parent, emigrate, get a new job, become unemployed, or retire? charts such as this one can be used to make comparisons, or chart changes over a time period. One issue however, is that Facebook is not wholly representative. There are, of course many people who do not have a Facebook account, particularly older people – therefore any data is likely to be skewed. 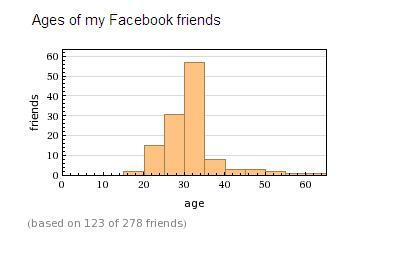 Looking at a bar chart of the age range of my contacts, also by Wolfram/Alpha, it is interesting to see that the ages of my friends approximates a normal distribution around my own age, but its positive skew is likely to be a result of this age bias. From the chart I can see that much of my social capital seems to be divided into distinct spheres; education, work, family and friends. In terms of education my connections are strongest from middle school and secondary school.Though there is some overlap with middle school, friends from infant school, or even earlier pre-school do not feature on the chart. This is perhaps likely to be because at that young age we do not form the same type of friendships and connections which we begin to do once at middle school; Friendships in these early stages could well be much more fluid and transient. Similarly my social capital relating to university seems to be rather sparse; my contacts and mutual connections both being particularly weak. This may be because I attended university in my home town and therefore was less part of the university ‘scene’, but perhaps more importantly university drew people from a very wide catchment reducing the number of mutual contacts compared to someone from school who grew up in the same area and went to work in the same area too. As many of my course-mates left the area following their studies the social network became dispersed. This is even more so the case when it comes to the two years of my masters degree. As the people on this course came from an even wider area, and as the course covered a shorter time period. In terms of work my latest job is further away from the main clusters; this is as a result of my job being in a different town. Though not far in terms of distance it shows that, in general, peoples networks are closely bounded by geography. My previous job I had obtained through old friends so it was much closer to my friendship cluster. As my previous jobs have been in very different organisations there is also no over-lap between my work clusters. 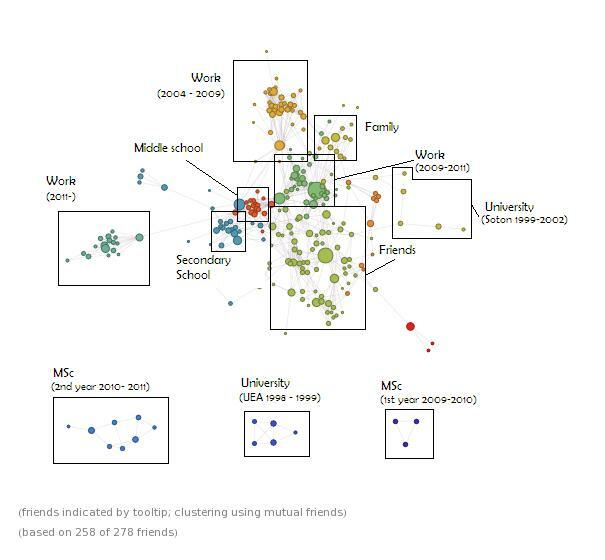 this cluster is as expected, however the previously mentioned age bias of social networking is perhaps undercounting this cluster more so than any others. Charts such as this one, using data held by social networking sites such as Facebook can provide an understanding of how social capital is formed and what factors affect this. The relative strength of social capital from school may go in part to explain the enduring power of networks based on the ‘old school tie’. Similarly the intensity of connections related to work can show the importance of professional networks.